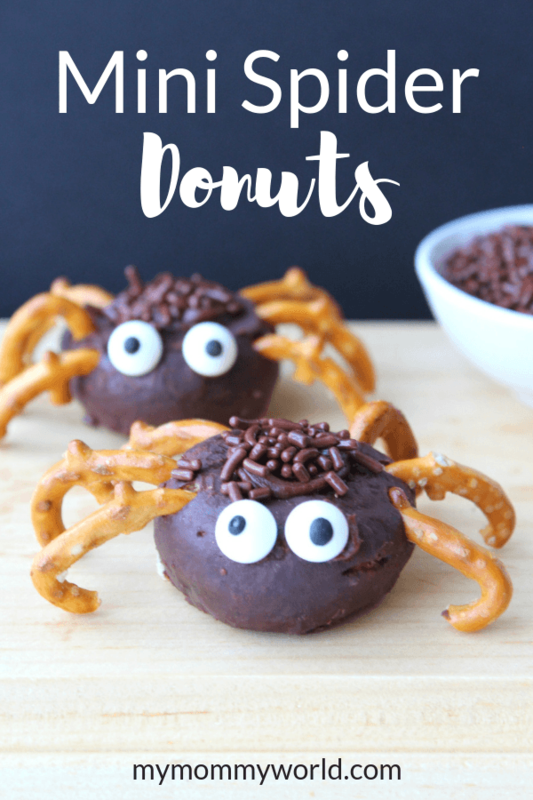 If you’re in the market for a fun, fast and easy Halloween treat to make this year for your kids’ school party…or your own creepy costume party…you’ll want to try these Mini Spider Donuts. Made from store-bought ingredients, they come together quickly, yet look like you got them from a professional bakery. They are so cute and chocolatey that no kid can resist sinking their teeth into them…even vampire teeth! It seems like every year, Halloween sort of sneaks up on me, and I’m rushing around at the last minute to find snacks to bring to my kids’ classroom parties. Of course, I usually do the pre-packaged treats or a fruit (like a clementine), but I always feel a little bit like they aren’t special enough to really make the party memorable. But these mini spider donuts are the best of both worlds: pre-prepared ingredients from the store made into a super fun Halloween treat with just a little bit of effort. Please note, this post contains referral links, which means that I will earn a commission if you make a purchase through those links. You’ll just need a few ingredients to make these spider donuts, which you can usually find at any local grocery store, or on Amazon. This recipe is so easy that your kids can make them mostly by themselves (they might need a bit of help with the pretzels and the piping bag). To begin, break up the pretzel twists to make the spider legs. This is a bit tricky…you want to make sure that you get a length of pretzel that is long enough, so it might take a few tries. When the pretzel pieces are ready, stick 6 of the legs into the sides of a donut to make the body of the spider. Next, place some chocolate frosting inside a piping bag fit with a small tip. Add some frosting to the center of the donut, in order to cover up the hole. Then add two dabs of frosting to the front of the donut and stick the candy eyes to it. 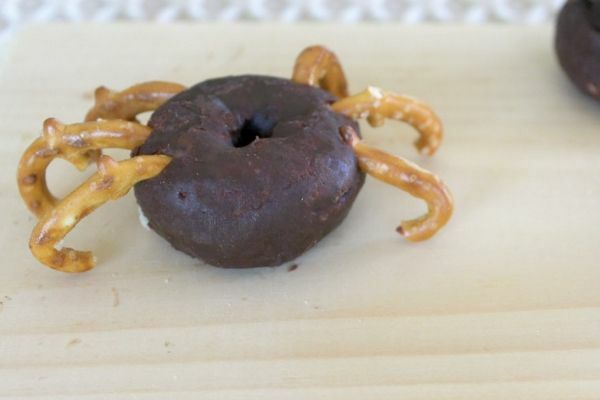 Finish off the spider donut by adding some chocolate sprinkles onto the frosting in the center. This makes it look especially hairy! These Mini Spider Donuts are fast and easy Halloween treats that are perfect for school parties. They come together very quickly with store-bought ingredients, but look like you spent all day decorating them! Break pretzel twists to a good length for a spider leg. Use 6 pretzel sticks and place into each donut as the legs of the spider. 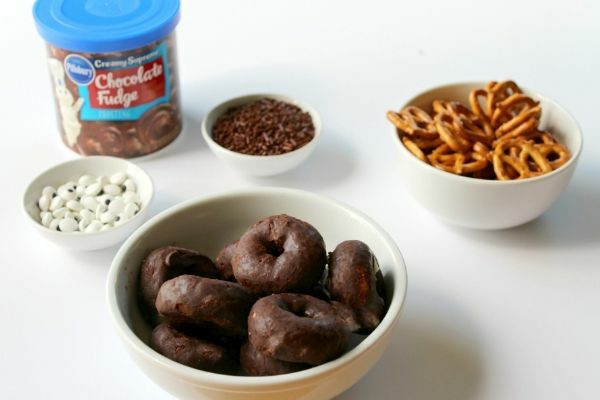 Fill in the donut hole by adding chocolate frosting with a piping bag and tip. Add the candy eyes to the front of the donut with 2 small dabs of chocolate frosting. Finish by adding the chocolate sprinkles on top of the frosting-filled center. For more fun Halloween treats, check out this list of 30 Fun Halloween Desserts! Erin Myers is a mom of two who understands just how hard being a mom really is. Her passion is teaching busy moms how to raise healthy kids and make happy and comfortable homes. Those donut spiders are so cute. I think my kids would love to make these. Thanks for sharing. These Spider Donuts are just adorable! Thanks so much for sharing your post with us at Full Plate Thursday, we have really enjoyed it. Hope you have a great day and come back soon!